In the last issue, I talked about outlining chord changes by using arpeggios and emphasising chord tones (as opposed to just playing one or two scales over the progression). For this column, I thought I’d explore this concept further by looking at the chord progression to a well-known song that you’re likely familiar with – the Jimi Hendrix classic “Little Wing”. The ten bar “Little Wing” chord progression is more complicated than it may appear at first glance. Whilst overall it’s in the key of E minor, there is a brief modulation to C major in bars 6-8 which is achieved via pivot chords (chords that are common to both keys). The harmonic rhythm also increases for these bars, with two chords per bar instead of one. Other interesting points to note are the chromatic Bbm passing chord in bar 5, and the brief bar of 2/4 time. I’ve notated an example of how I like to follow the chord changes in this song. Starting off with Hendrix’s famous line, I then move to a bending lick that emphasises the third of the G chord (B). A quick sweep picked Am arpeggio outlines that chord, and I then descend using an E blues scale over the Em in bar 4. For the next section, I use arpeggios to effectively delineate the Bm, Bbm, Am, and C chords. Making sure to emphasise the F natural note during the key change (the one note that differs between the keys of E minor and C major), I finish off with some Hendrix-style octaves using a D major arpeggio. As mentioned in the last issue, a great way to practice outlining changes is to solo without the accompanying chords, but in such a way that you can still hear the tonality of the chords as they change. 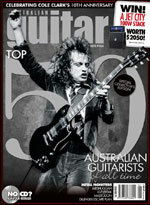 If you check out the audio at www.australianguitarmag.com.au, you’ll hear that although I’ve played this solo with no backing track, you can still recognise the chord progression. 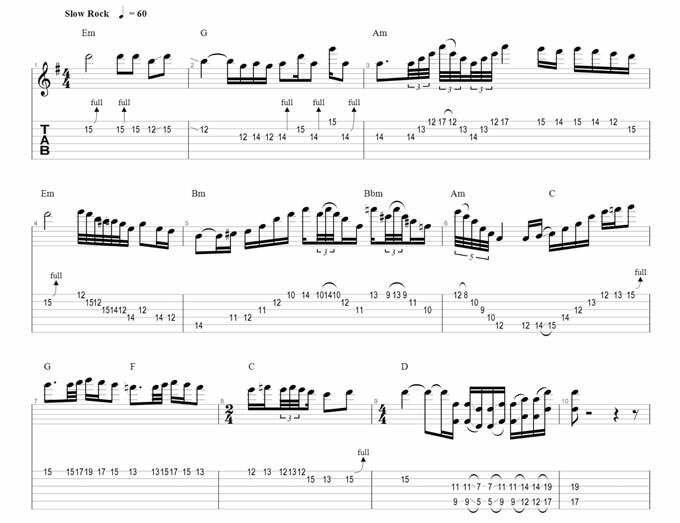 I’ve always found “Little Wing” to be an awesome track for practising this type of soloing. Give it a try!